Posted on 24, October 2016 by EuropaWire PR Editors | This entry was posted in Aviation & Aerospace, Defence, Security & Safety, Technology, United Kingdom and tagged Advanced Precision Kill Weapon System, APKWS, BAE Systems, laser-guided rockets, U.S. Navy. Bookmark the permalink. LONDON, 24-Oct-2016 — /EuropaWire/ — New facility in New Hampshire is optimized for precision guidance solutions and designed to meet a significant increase in production. The U.S. Navy has awarded BAE Systems a contract worth as much as $600 million to fulfill the growing demand for Advanced Precision Kill Weapon System (APKWSTM) laser-guided rockets. With an initial award of more than $130 million, the three-year, indefinite delivery / indefinite quantity contract will help speed the delivery of these precision guidance rockets to meet the needs of the U.S. Navy, U.S. Marine Corps, U.S. Army, and U.S. Air Force, as well as a growing number of allied nations. To meet this growing demand, BAE Systems has invested in a new facility in New Hampshire that is optimized for precision guidance solutions and designed to meet a significant increase in production. The company expects it will be able to ramp up production to 20,000 APKWS guidance units per year with potential for additional growth. Challenged by budget constraints and increasingly urban battlefields, militaries around the world are seeking cost-effective, precise weapon systems that limit collateral damage. Built around BAE Systems’ proprietary Distributed Aperture Semi-Active Laser Seeker technology, with a mid-body guidance section that fits between the motor and the warhead, the APKWS solution easily transforms a standard unguided 2.75-inch (70 mm) munition into a highly accurate precision laser-guided rocket. This design requires no modifications to the rocket, launch platform, or launcher system, and it allows militaries to leverage existing infrastructure and munitions investment with minimal effort and training. Under a Navy program of record, the system has been used by the Marine Corps since 2012. 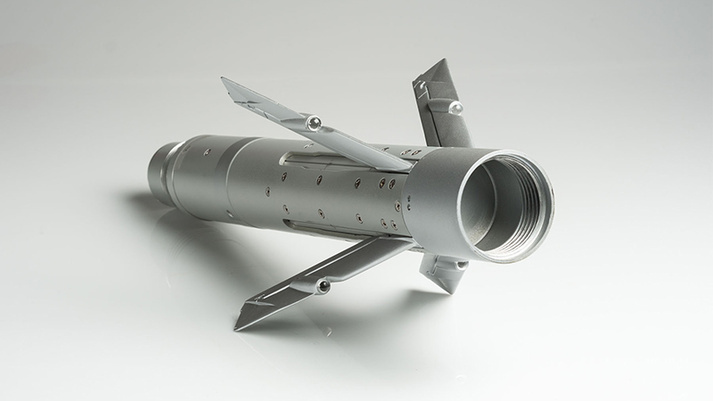 The APKWS laser-guided rocket is becoming ubiquitous in theater as a result of its exceptional accuracy and advanced modular design, which makes it exceptionally versatile to address various mission sets and allows for streamlined deployment on a variety of platforms. The system has already been qualified or demonstrated on more than 14 rotary- and fixed-wing platforms. The APKWS rocket is currently available to international customers through the U.S. Foreign Military Sales program. More information on the APKWS rocket can be found at www.baesystems.com/apkws.